And along the way I came up with some essential tips that I’d like to share with you. 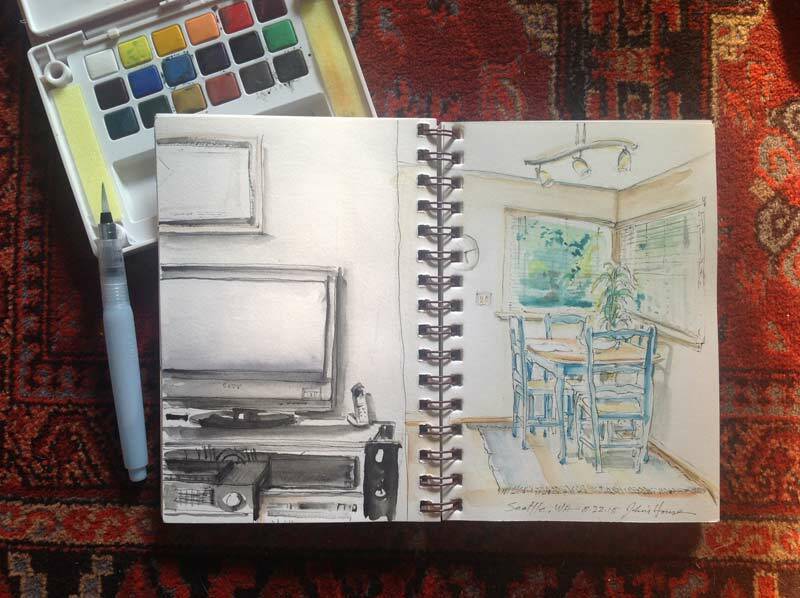 Here’s what I learned about the art of sketching while on the road. 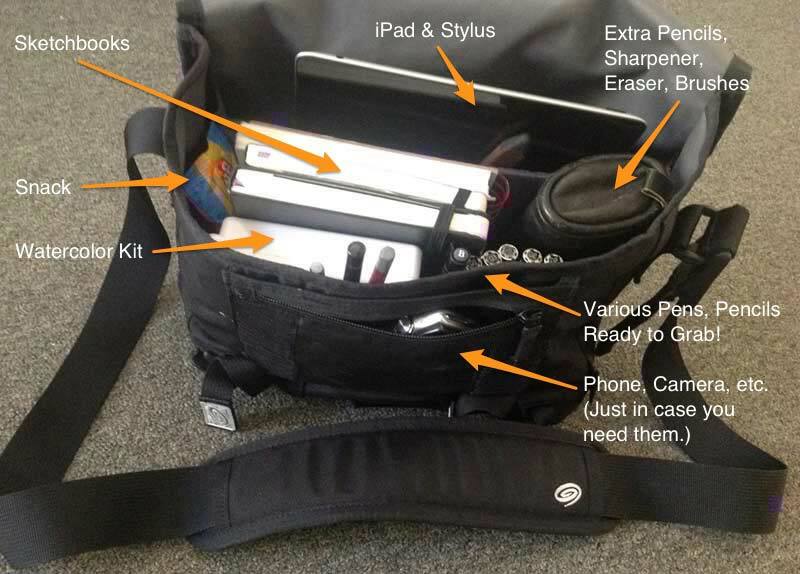 Pack the Essentials I like my Timbuk2 messenger bag because it is lightweight and designed for efficiency. Just open it up and quickly wield your drawing instruments of choice. I tried to have it on my shoulder at all times when taking in the sights. One never knows when the inspiration to sketch, or the need to take notes, will strike. Use Your Sketchbook as a Camera I think of my sketches as snapshots. The more I focus on observational drawing from spontaneous moments in life, the richer the experiences and memories are of those moments. 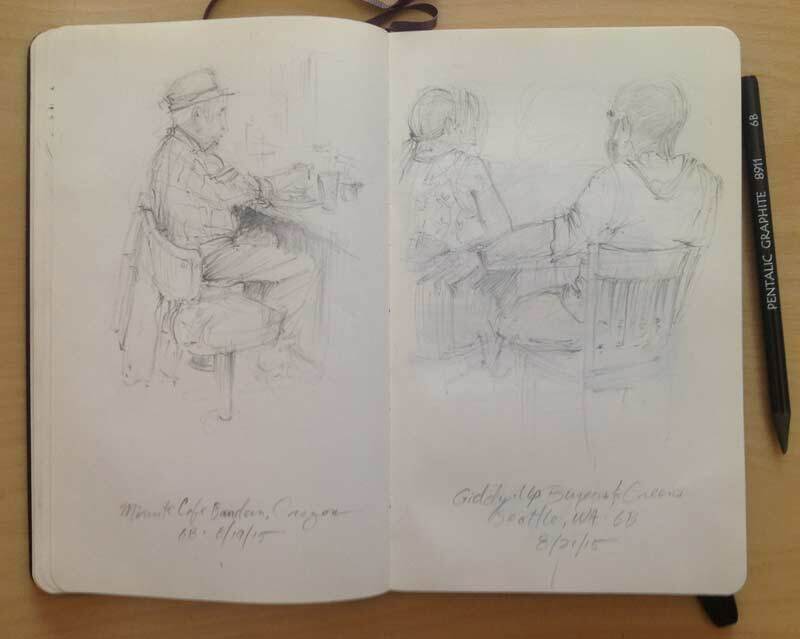 From the outset, the mission of this trip was to use sketchbooks to record as much as possible. The first stop of the sketch safari was the Cantor Gallery at Stanford University to take in a fantastic exhibit of Italian masters. Some of my biggest drawing heroes were there. (left) Michelangelo Buonarroti, black chalk on paper, ca. 1530. (right) Luca Cambiaso, ink over traces of black chalk on paper, ca. 1555–59. Prime Your Brain For Drawing I didn’t realize how much impact viewing the master drawings at the Cantor Gallery would have on the rest of the trip. 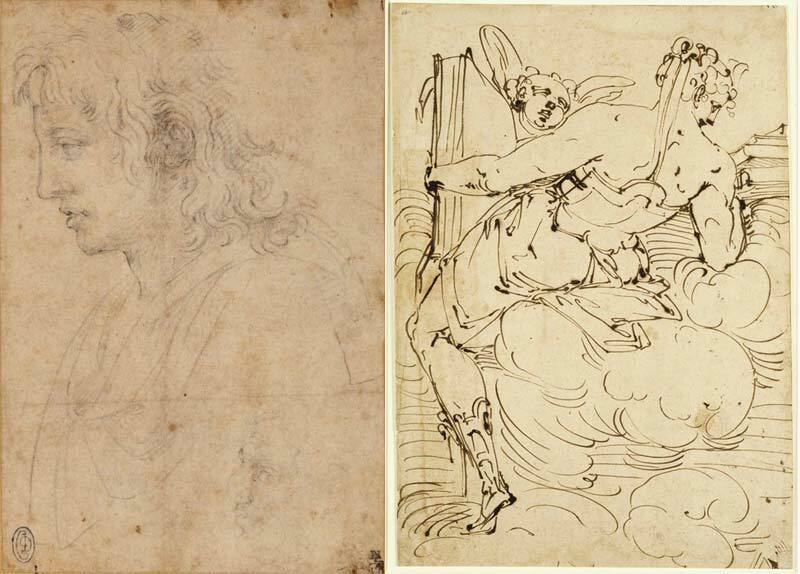 Getting up close to drawings by brilliant draftsmen such as Durer, Michelangelo, Cambiaso can trigger new ideas for techniques and strategies. The energy of Cambiaso’s pen strokes fired up my sketching neurons with ideas on how to suggest 3D form with economy of lines. After the exhibit, it was time to get back on the road. Passing through Oakland, then on to a picturesque drive along Highway 128, the first destination point of the expedition was reached—Mendocino, California. Draw What Interests You Upon arriving at Glendeven Inn, I was captivated by the variety of subjects to draw—quaint architecture, lush landscapes, sweeping ocean views, and telephone poles. Since the focus of a sketching vacation is to get into the rhythm of drawing often, it’s imperative to set the tone early on. If something stops you in your tracks and compels you to draw, put the camera away, take out your sketchbook, and sketch it. I got started even before unpacking the luggage. 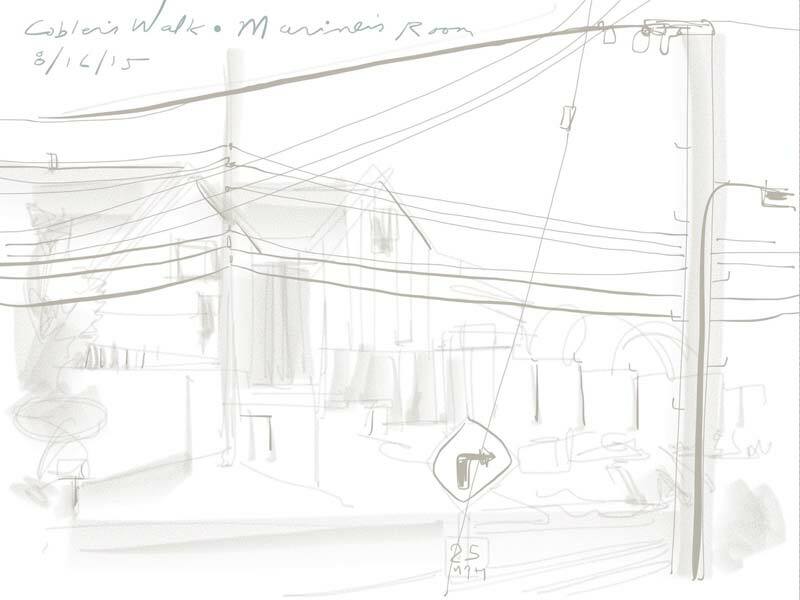 Fascinated by the juxtaposition of power lines and rustic wooden buildings outside the window, I grabbed my iPad and stylus to jot a quick study of dominant angles and curves. Spontaneous sketches helped maintain creative momentum during the trip. My fixation on nearby telephone poles and cables carried me into a longer study of a view of Glendeven Inn’s lovingly restored buildings. 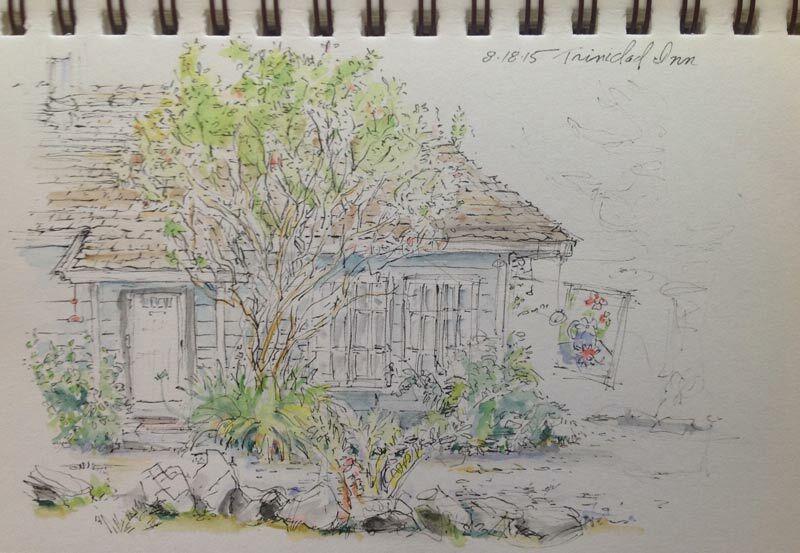 Sitting across the street, on Highway 1, time passed swiftly as I sketched. 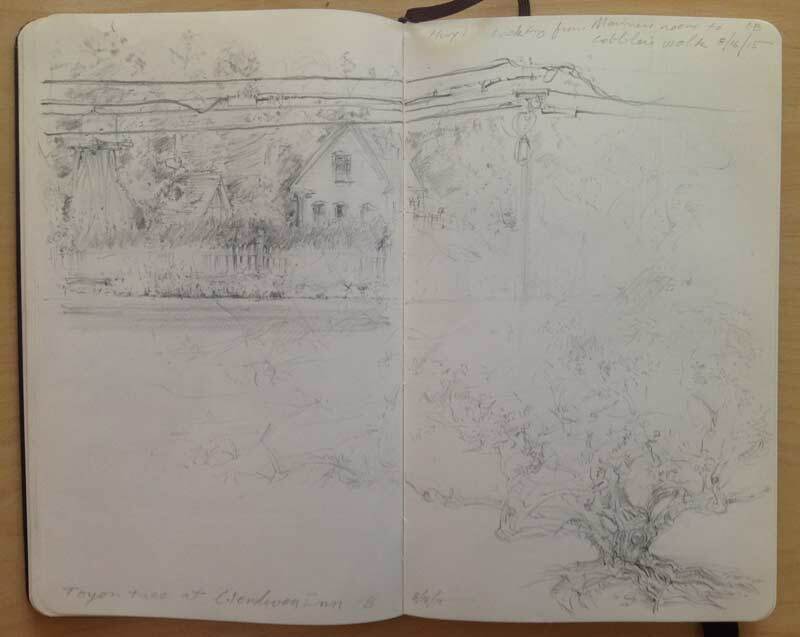 In the evening, while enjoying local wines, clam chowder, and the refreshing ocean air, I added a pencil sketch of a Toyon tree in the lower corner of the same page. Step Out of Your Comfort Zone If you want to rekindle your desire to draw and improve your skills, it’s important to explore new materials and techniques. I tend to find comfort with my usual go-to sketching tools such as pencils and Moleskine sketchbooks, and avoid experimenting with new ones. But a main goal on this trip was to try the new Koi watercolor travel kit tucked away in my bag. 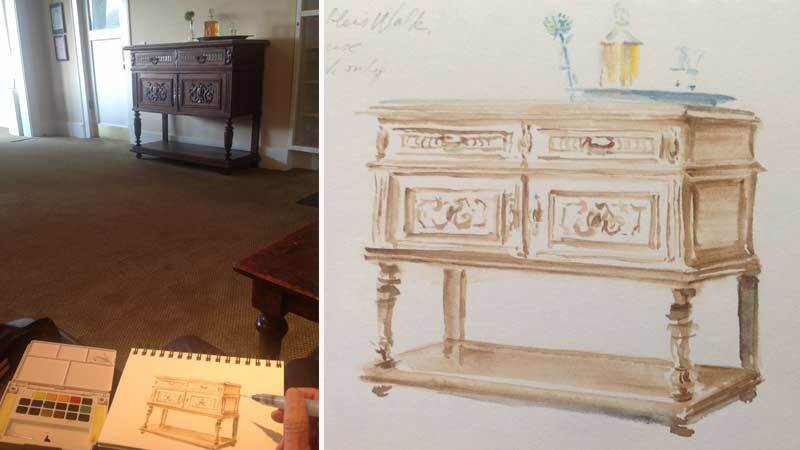 Early morning sketch of an antique buffet—learning to use this Koi brush is going to be fun! Wake Up With the Roosters Getting up before everyone else helped me to focus creatively. The solitude allowed me to try my new watercolors without the distraction of other people in the B&B lobby. The predawn drawing subject was an antique buffet. Instead of starting with an ink pen for the line work, I did the entire sketch using only the Koi brush. It was love at first brush stroke! Find Solitude Whether getting used to new drawing materials or escaping a hectic schedule just to relax, discovering quiet places to draw is a huge reason for taking a vacation like this. 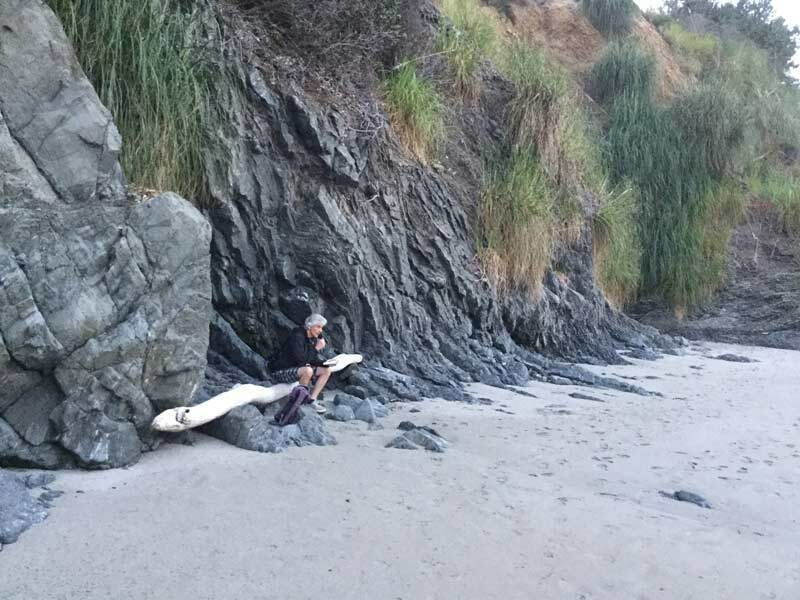 The rhythms of breathing, drawing, and observing nature were a relaxing preparation for proceeding up the coast to Trinidad, California. This hotel office and surrounding garden was like a whimsical, storybook setting—perfect for playing with ink and watercolor washes! Enjoy the Hunt for Compositions The excitement of drawing again with the watercolor kit got me out of bed early at the Trinidad Inn. Before the commotion of continental breakfast, before the rumbling engines of luggage-laden SUVs, I was on the prowl for subjects to sketch. I started the composition, shown above, by sketching lines with a Micron 02 pen; then experimented with various colors to match my observation. Finding pure joy in loose pen strokes and washes, I was fast becoming hooked on sketching with ink and watercolors. Mix it Up! Keep your draw time enjoyable by shifting gears. Even though this trip focused on traditional sketching tools, I always had my iPad with me. 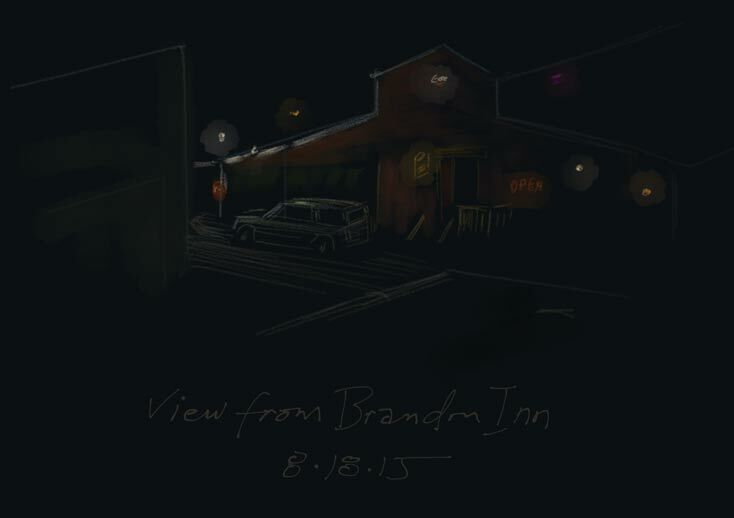 Not only was the iPad helpful for writing this travel log, but also came in handy for doing an early morning digital sketch of the harbor area of Brandon, Oregon. Standing on the hotel balcony, I opened the Paper 53 drawing app, dropped a dark background on the page, and did a study of a few predawn harbor lights. Mix Dining and Drawing Turn your dining pleasure into fun drawing practice. People can portray the character of the places you visit, whether your models are eating scrambled eggs for breakfast, or fish and chips while watching football on TV. Take a deep, calming breath, grab your book, and sketch like the wind! Once you get comfortable with drawing people in action, the rest of sketching in public is a cake walk. Be brave, take your sketchbook everywhere you go. After driving a bit farther along a peaceful Highway 1, then turning inland to Interstate 5, the late afternoon arrival in Portland was somewhat jarring to the senses. But the downtown energy was exciting! Seek and ye shall find! Tucked away, in the lower level of the Portland Art Museum, is a beautiful collection of master etchings, including this line up by Albrecht Durer. Recharge Your Creative Batteries If you’re in a big city, seek out drawings by major artists to keep your sketching flame alight. 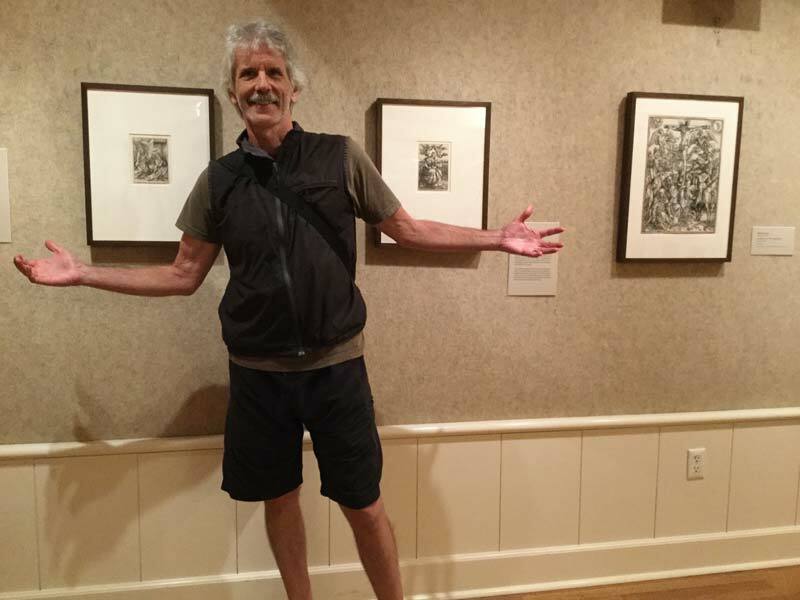 I scored big with another dose of Albrecht Durer—this time, in a selection of exquisite etchings at the Portland Art Museum, shown above. Being able to get up close, I was able to see the delicacy and purpose of masterful line work. 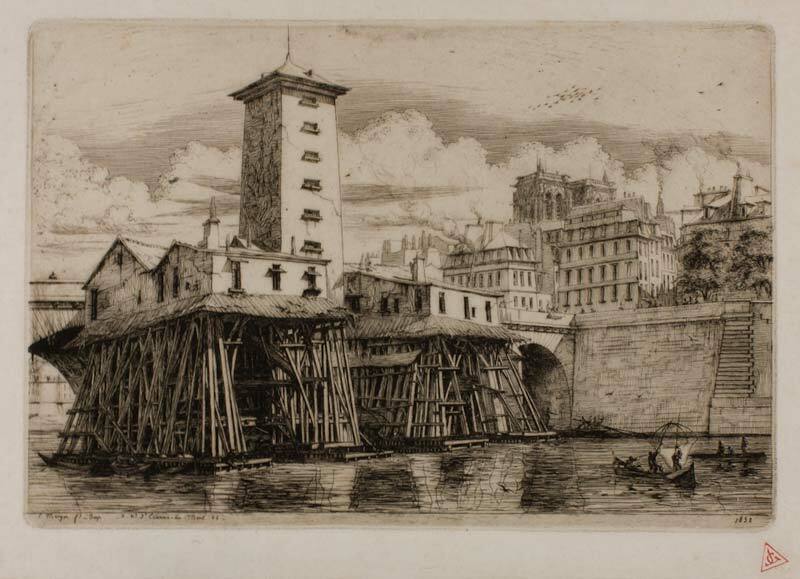 Even though it is a print, the above etching by Charles Meryon (French, 1821-1868) is one of the coolest urban drawings I’ve ever seen. I’d love to see the original sketches for this one. Scouting out the local book store can also be a source of drawing inspiration. When in Portland, Powell’s Books—arguably the world’s largest bookstore—can be total inspiration overload! 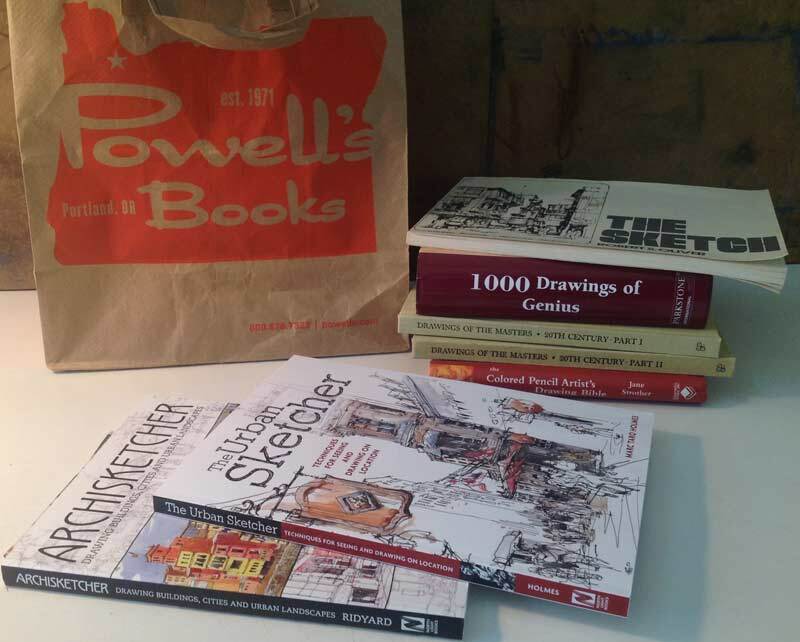 I gathered some resources to stoke the creative fire for upcoming adventures in urban sketching; then it was off to a good night’s sleep before hitting the road again in the morning. Use Hotel Mirrors: There are always large mirrors and chairs in hotel rooms and B&Bs. They allow great opportunities for doing a self portrait or two. I couldn’t pass on the chance to record early stages of beard growth, shown above. Tech behemoths such as Microsoft and Amazon have transformed Seattle into the fastest growing city in the nation. 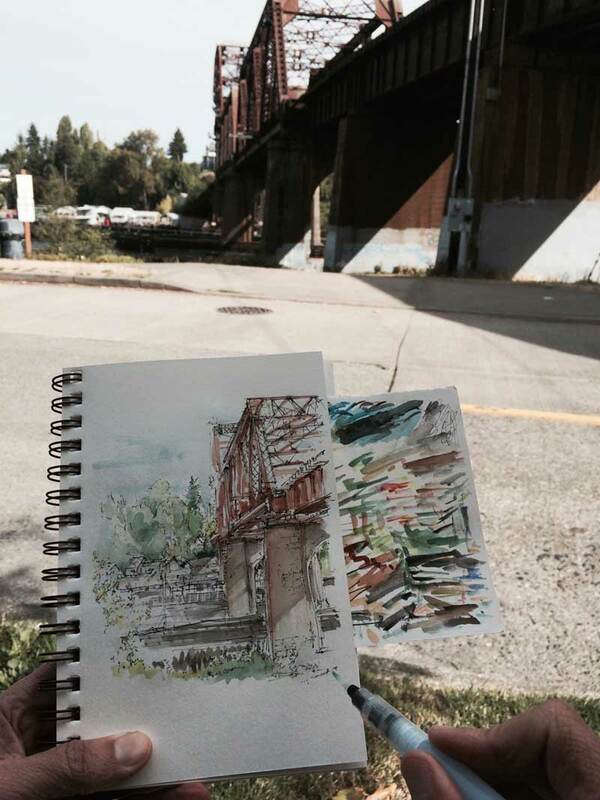 The dizzying mashup of skyscrapers, 19th century brick buildings, bustling waterways, and evergreen trees make Seattle a world-class destination for urban sketchers. React & Capture The rhythm of urban sketching is faster paced than drawing on a beach or in a forest. 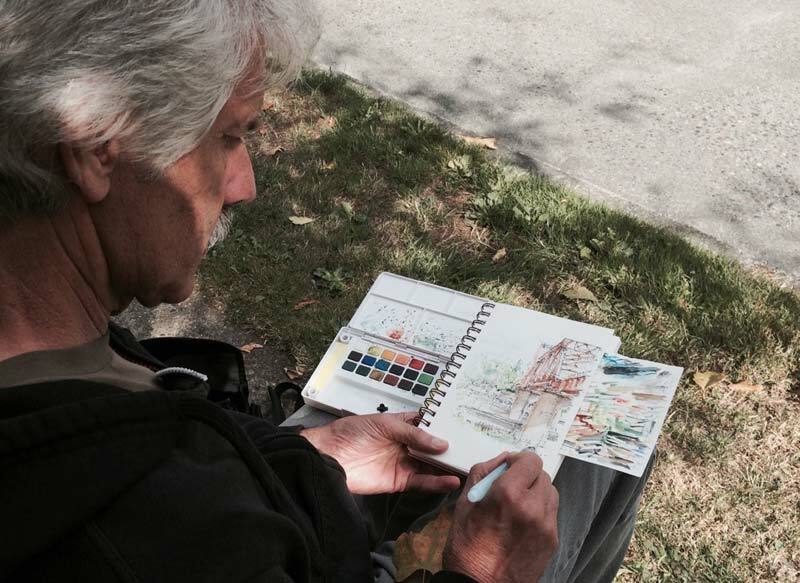 Being on city streets is where using a portable watercolor set can be advantageous. I quickly realized how fun it was to react to the myriad colors and textures by simply pushing and pulling puddles of color around on the paper. A weathered brick wall is suggested with a dab of color; a tree trunk is indicated with a few easy sweeps of a brush. Sketch Anything & Everything The buzz of downtown sketching carried right into the evening’s activities, as we relaxed at my brother’s house in Seattle. At this point of the trip, having a sketchbook in hand became second nature. No one seemed to notice how enthralled I was with the process of squeezing water through the handle of the Koi brush and pushing paint around on paper. You know your habits have really changed when you can effortlessly sketch a dining room while simultaneously participating in conversations about politics and the Seahawks. Sketching in this mode is like a form of doodling—just relax and enjoy drawing whatever comes into your field of vision. What to Leave in, What to Leave Out Gas Works Park, on Lake Union in Seattle, was a gas manufacturing plant in the early 1900s. Steel boilers and compressors, the size of huge apartment buildings, were converted into a public park in 1975. 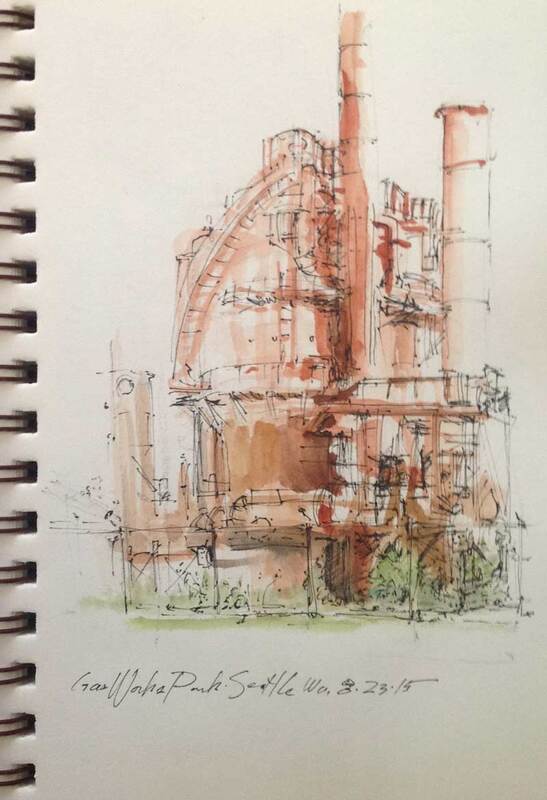 While sketching these towering objects, I began to develop a routine for quickly mapping out my compositions. I started using pen and brush strokes to locate features on the rusted machinery. By using these landmark features as anchor points, I was able to quickly measure and sketch accurate proportions. I learned that only the essential details are necessary in urban sketching. Participate in the Culture of Drawing It’s vital to learn about drawing whenever and wherever possible. I made it a point to purchase a seat at an extraordinary two-night lecture by Michael Grimaldi at the Gage Academy in Seattle (where Juliette Aristides started her drawing atelier). 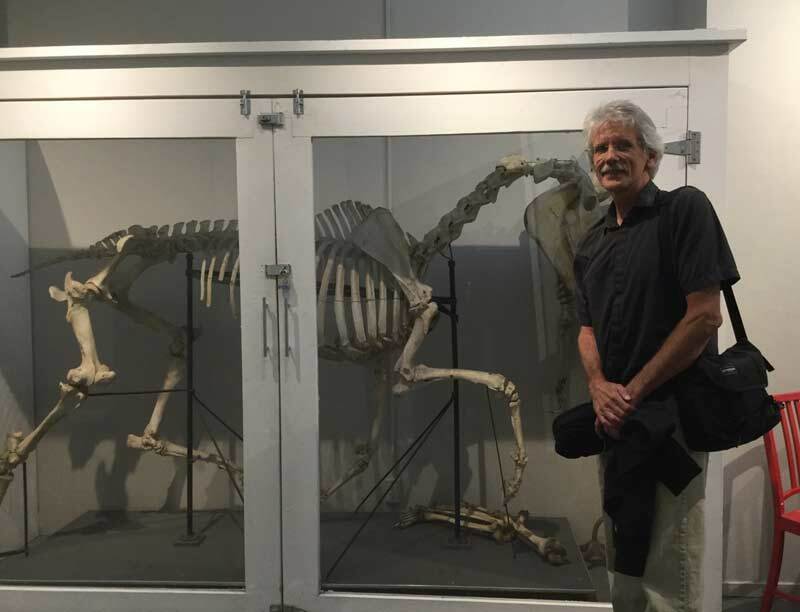 I became enthralled with Grimaldi’s arcane knowledge of the structure of the axial skeleton and the bio mechanics of human muscle sets. 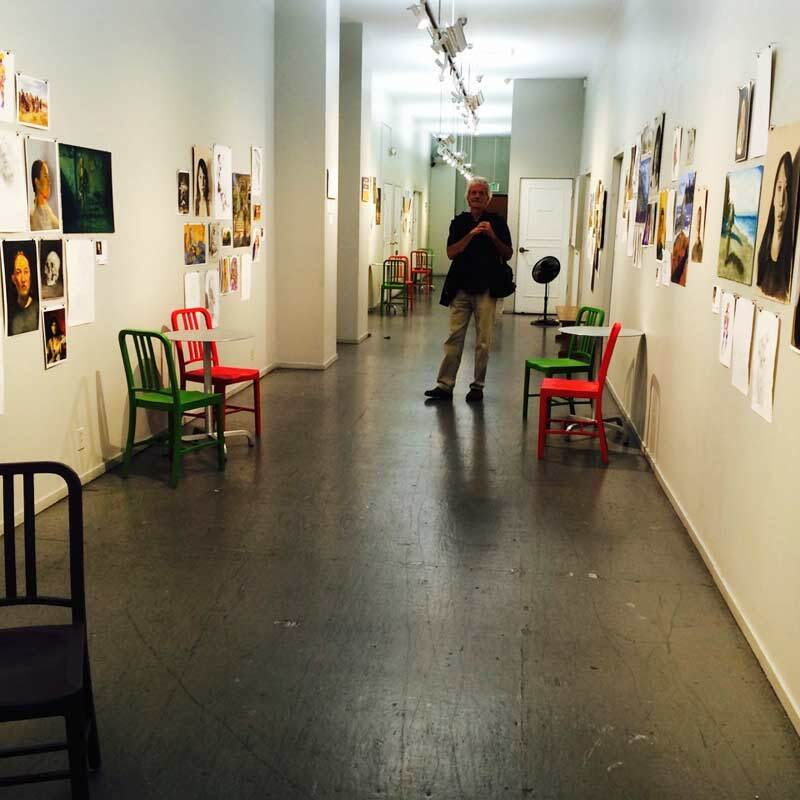 After two nights of outstanding lectures I toured the facilities of this amazing art school. Seeing the stellar work by students inspired many ideas for lessons and ways to help my students build their portfolios. Gotta get one of these guys for the Scribbles Institute studio! 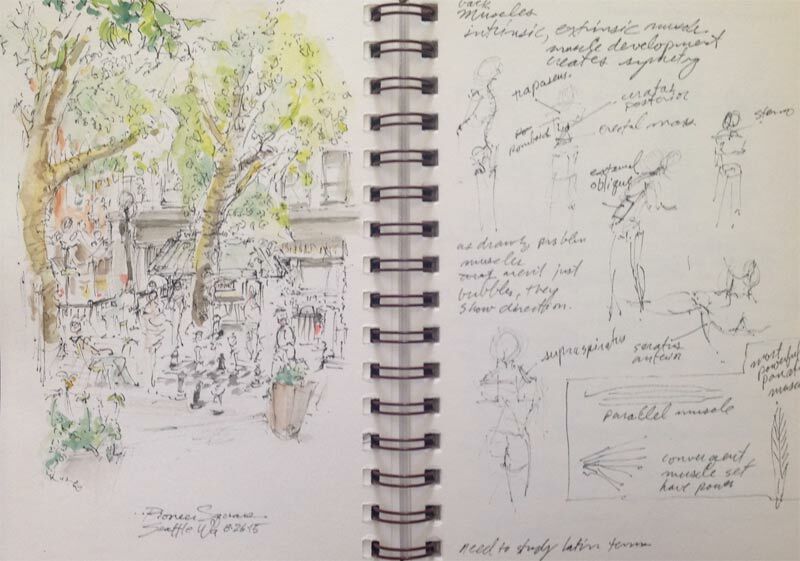 While learning how to locate and traverse bony anatomical landmarks and muscle sets on the human figure, I realized that I was applying the same process to find proportions in urban sketching. Become Fascinated You’ll know it when it happens. You’ll feel it in your drawing hand. You become so captivated with a subject that it takes you down the mysterious rabbit hole of in-depth studies. Fascination with observing the nature and structure of things is what keeps you going, sketch after sketch. And it is this deep fascination that makes your work interesting to look at. 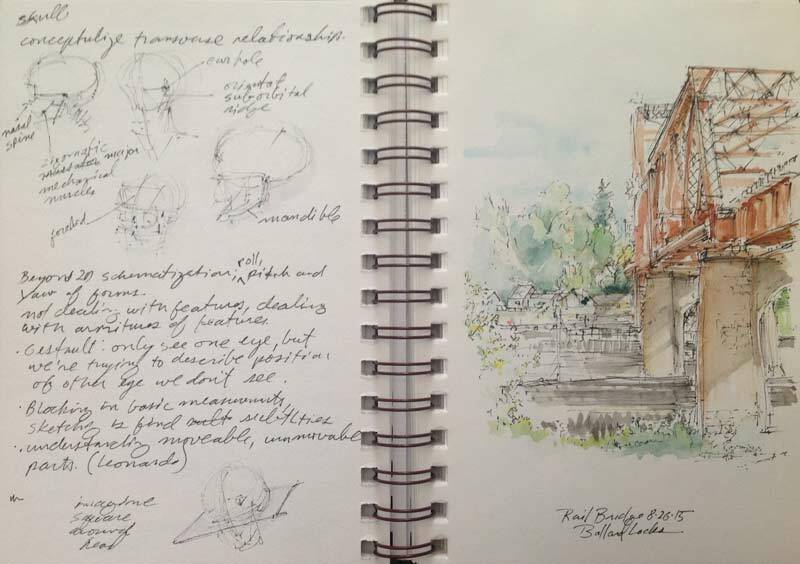 The biggest challenge of the above study was to map out the dominant angles of the composition—the angle of perspective of the bridge and the repetition of angled, steel girders. 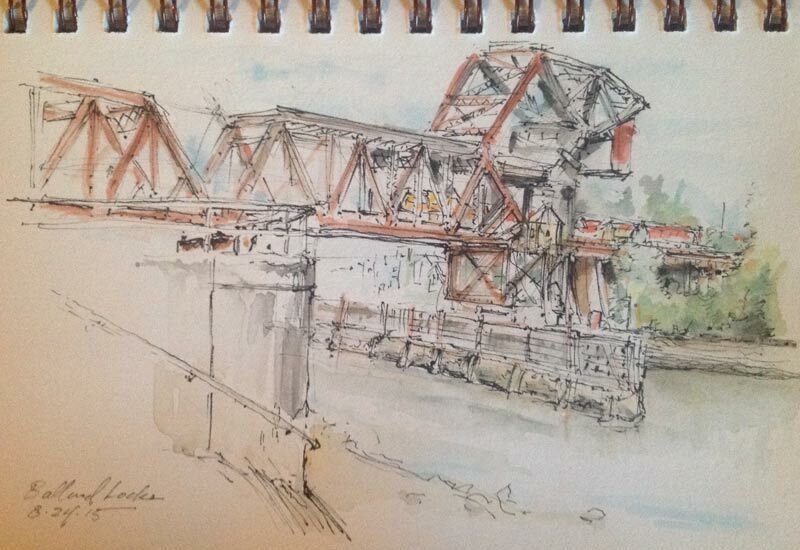 The train on the bridge is actually a composite of remembering several trains that passed earlier as I sketched. As the draw bridge began to swing up toward the sky, I knew there was only a short time to capture the snapshot. Pushing the speed of my line strokes, I studied the angle of the bridge’s position and only the essential, structural details. A large boat passed, then it dropped back down for me to resume my previous study sketch. It’s during moments like this bridge sketch session, when your skills and materials become one, that you realize you’re doing just exactly what you’re supposed to be doing in life. As we were walking back to my brother’s house, after sketching the rail bridge, I noticed another dramatic view of the bridge. I was excited all evening as I thought about ways to capture the angles of the bridge and shadows underneath it. 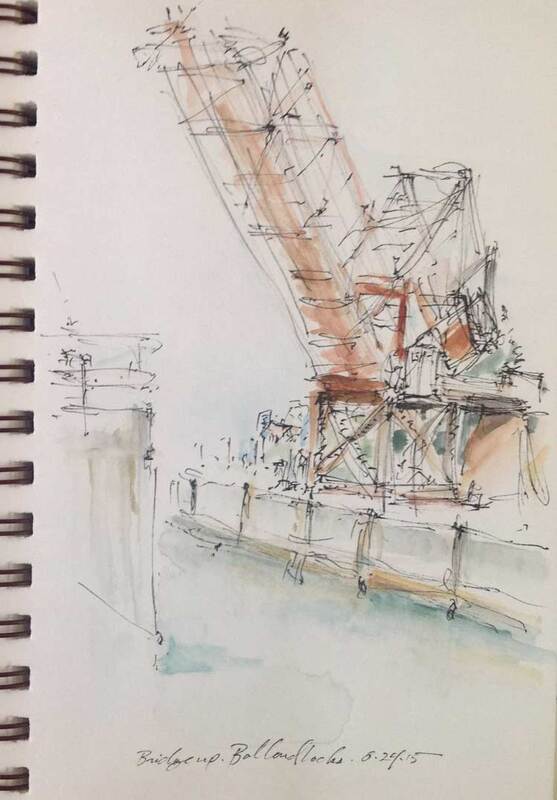 The next morning I returned to the location (shown above), started sketching, and experienced one of the highlights of the entire sketch vacation—simply capturing the essence of a rusty, old rail bridge. At the end of the road trip, while unpacking in my Santa Cruz studio, I opened my sketchbook to reflect on what I gathered from the bountiful journey to the Northwest. I learned that exploring new places inspires experimentation with new tools and techniques. I realized that having the courage to start new habits, such as urban sketching with watercolors, greatly improves your drawing skills. 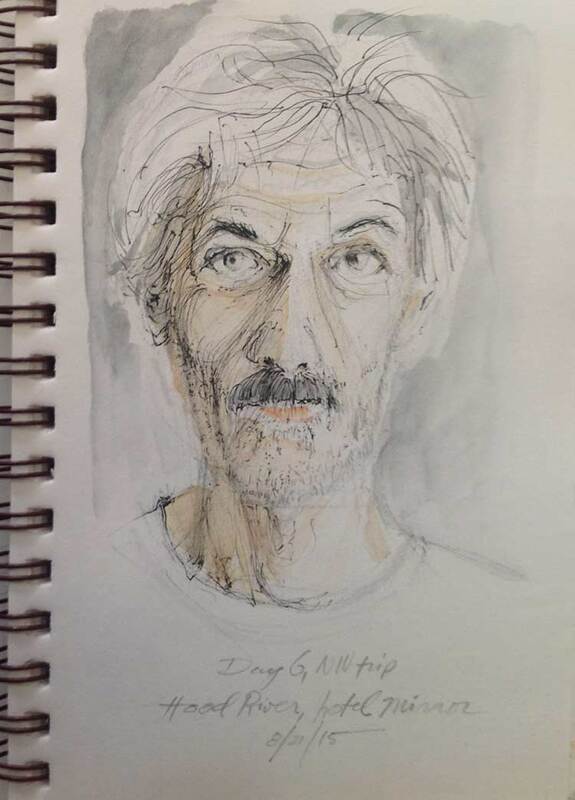 And I found that getting on the road, relaxing into a change of scenery with the intention to sketch, will surely lead you to discovering your truest, honest desire to draw. I put my sketchbook back in my bag and began to think about tomorrow morning and all the possibilities of sketching in the streets of my own hometown. Want to sketch with me? Join SketchTribe workshops.